Organizational Processes – Arbitration, negotiation, adjudication, delegation, escalation, documentation, communication … the “decisioning” aspects of governance require workflow and formal organizational structures/processes ala the corporate familiar RACI matrices (R = Responsible, A = Accountable, C = Consulted, I = Informed). Clearly, the ultimate goal is to enable enterprises to establish and sustain effective operational Master Data Governance councils. Data Policy Management – MDM hubs have always been “data policy hubs” in my experience — it’s just been a matter of to what degree the hubs support the externalization and integration of such data policies with the rest of the enterprise. Statements of Intent and GRC policies must do more than reside in metadata repositories or business glossaries. Proactive Data Stewardship – There are both in-bound and out-bound entry points for data trustees/stewards and these require more than just reactive/downstream GUIs whereby subject matter experts (SMEs) correct outlier data entry issues. Specifically, a key requirement is for proactive/upstream data validation at the point of entry for both master data and the source systems that feed the MDM hubs. Business and IT Metrics – Data governance scorecards and dashboards help monitor via KPIs for both quality and completeness. Such success metrics are critical to monitor and measure if policies and processes are working — not just IT metrics such as reduction in duplicates, but also business metrics such as reduction in time to onboard new customers or products (and the resultant savings or increased profitability). Clearly, there currently exists a major gap or chasm between an enterprise’s requirements for operational Master Data Governance and what is currently offered by the mega vendors (IBM, Informatica, Oracle, SAP). 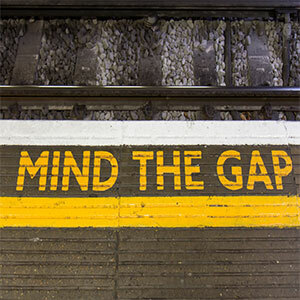 “Mind the gap” is the watch phrase as organizations look to invest in “operational” Master Data Governance to drive MDM sustainability and ROI. Passive-Aggressive Data GovernanceOne of the greatest challenges in MDM is the political arena (“governance”) which necessarily accelerates or brakes the critical momentum of both tactical and enterprise MDM. While tactical MDM marts may be successful via judicious efforts of data stewards who focus on the data quality of a singular domain, when the business utilization of master data expands across departments and lines of business then the governance framework is essential. Each and every consuming and producing organization has a duty or role in the governance of master data. For example, once it is determined that master data is “a corporate asset” then that data must be protected across its life cycle from creation/capture through its retirement including such critical issues as accessibility and compliance. The is tendency to apply project-oriented methodology rather than an asset-focused methodology; overall, such methodologies miss the asset aspect of data … e.g., cost, decaying value, ROI for cleansing data, etc. Lack of support for the “community” aspect of shared asset development – e.g. wikis for global corporate business vocabulary, etc. Unfortunately most of the marketed MDM solutions do not adequately address this formal requirement. And to make matters worse, the vendor community has engaged in its own “scope creep” by usurping and permutating every possible variance of “passive”, “active”, “proactive” and “integrated” when it comes to marketing adjectives for their Data Governance offerings.In fact, most solution providers still will point to their data steward console as the acme of their Data Governance capabilities. In reality, what’s needed are formal processes, assisted by workflow software, to enable formalized decision making, documentation, and delegation, regarding the rules rendered as part of the end-to-end (E2E) governance lifecycle. Another gaping hole in Data Governance capabilities of the majority of MDM vendors is their inability to directly store and execute such governance-generated procedures as part of the MDM logic that controls the software which in turn should enforce the governance. Effective and sustainable Master Data Governance mandates the integration of people, process, and technologies via a formalized framework. These formal structures are inevitable as they are the key enablers of Master Data Governance policy functions – much more so than the current generation of manual, paper-based methodologies and accelerator/frameworks. Data Governance – The formal orchestration of people, process, and technology to enable an organization to leverage data as an enterprise asset across different lines-of-business and IT systems. Passive Data Governance – Data steward consoles and other reactive data management capabilities focused on after-the-fact data compliance; often batch-like and not integrated with MDM. Active Data Governance – Metrics-enabled, upstream data policy enablement; replaces manual data admin processes with role-based, real-time subject matter expert (SME) empowerment. Proactive Data Governance – Metrics-driven, crowd-sourced capability for business users and IT to actively control their shared data across different lines of business and IT systems. Introducing a new marketing term … “Passive-Aggressive Data Governance.” Vendors and other solution providers who market one version (typically “active” Data Governance) but deliver a different version (typically “passive” data governance) have provided us the opportunity to coin yet another descriptive term for such offerings. In the world-at-large, when a person says one thing to you, yet does another it is generally known as “passive-aggressive behavior”. Hence our term “passive-aggressive Data Governance” for most of the currently marketed Master Data Governance solutions! The Master Data Governance market is actually just beginning its momentum toward modest adoption and penetration. During the next five years, we will also see buyer behavior migrating from point products (i.e., to address customer or product Master Data Governance only) to enterprise Data Governance (supporting multiple entities/data domains such as customer, product, supplier, location, price, etc.) — and, to a lesser extent, from software products to hosted/managed services (cloud-based software as a hosted service). Concurrently, the mega application package vendors will increasingly bundle in industry- and application-specific operational Master Data Governance offerings. In summary, don’t settle for “passive” (downstream) Data Governance but rather demand “proactive” (upstream) Data Governance… and avoid “passive-aggressive” vendors’ offerings.